Joel Feder March 2, 2018 Comment Now! Alfa Romeo finally has what Americans supposedly desire: a premium, compact crossover SUV. These hatchbacks on stilts provide consumers the practicality wagons offered for years with the lifted stance and available all-wheel drive they think they need. When winter weather turns nasty, crossover SUVs show their true colors, for better and worse. 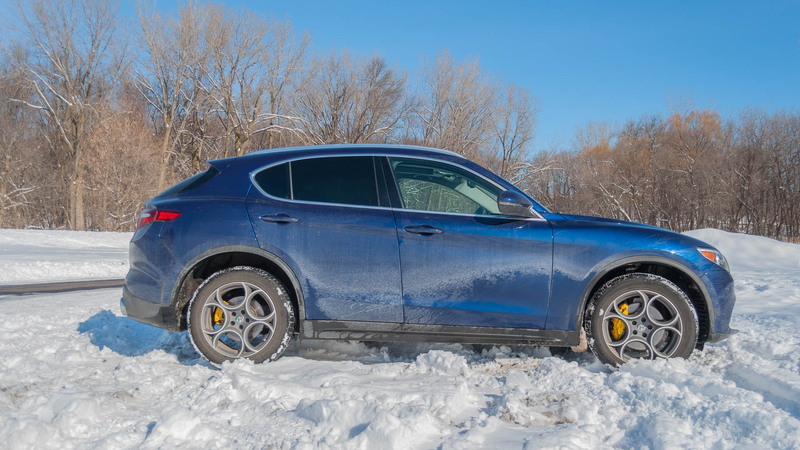 In the case of Alfa Romeo’s Stelvio, the Q4 all-wheel-drive system, ground clearance, and all-season tires were all surprisingly capable when the fluffy, cold, white stuff started flying. 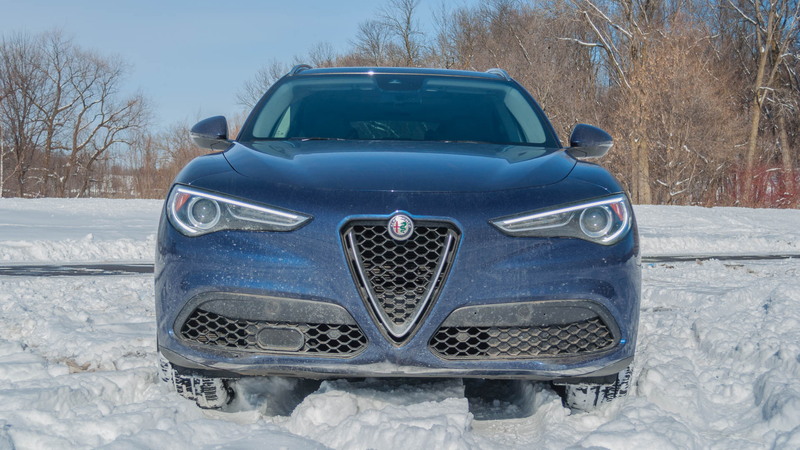 Here are 6 things learned from tackling snow in the 2018 Alfa Romeo Stelvio. Many all-wheel-drive systems today have driver-selectable modes that tailor the system and electronic aids to certain situations. The Stelvio’s simpler. It has the Italian automaker’s “DNA” selector, which puts the powertrain in Dynamic, Normal, or Advanced Efficiency modes. None of these are snow modes—none exists. An Alfa Romeo spokesman told Motor Authority to just let the Stelvio’s all-wheel-drive system do its own thing in Normal mode. 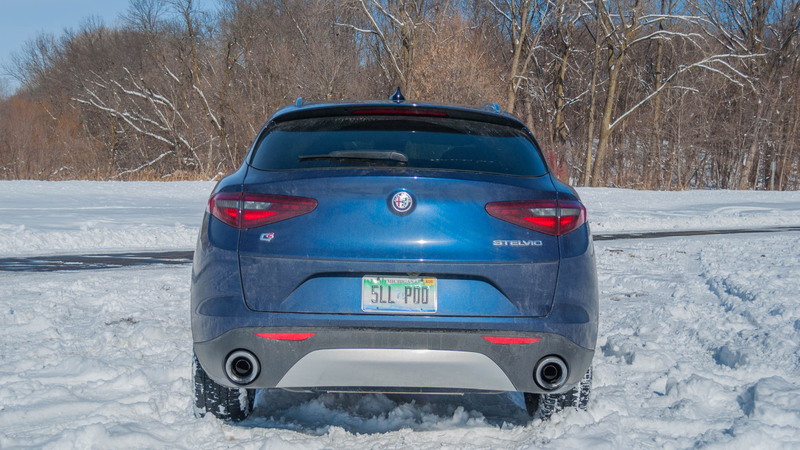 Taking that advice and expecting sloppy results, the Stelvio surprised and delighted with its ability to quickly, quietly, and effectively distribute power as it tackled snow more than a foot deep. The system moved power to the wheels that had traction without making a fuss, and the electronic stability control light that indicates slippage or electronic intervention rarely flashed. 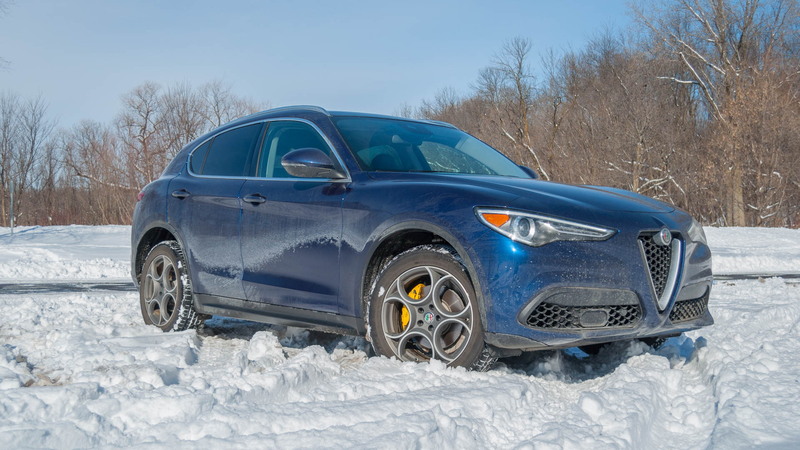 The Stelvio tested was equipped with optional 19-inch dark, five-hole aluminum wheels wrapped in 235/55 Continental Cross Contact all-season tires. Generally speaking, all-season tires aren’t great as they are meant to do everything, but they aren’t great at anything. When it comes to cold weather and snow performance, their deficiencies shine. In the case of the Cross Contacts on this Stelvio, performance and traction were not only surprising, but also impressive. Powering through more than 12 inches of snow didn’t seem to phase this setup. Electronic stability control systems (ESC) are the single greatest safety innovations introduced in the automotive industry in the last 20 years. Every new vehicle sold on the market has them as standard equipment, and they help keep a vehicle in control when conditions are less than ideal, or a vehicle loses control. Sometimes a driver wants to turn off this safety system, whether it’s to safely slide sideways or because the vehicle is stuck and wheelspin is needed to rock the vehicle free. The 2018 Alfa Romeo Stelvio doesn’t turn off ESC for any reason, at any time. Good luck rocking the Stelvio out of a sticky situation with ESC. Like most crossover SUVs and hatchbacks, the Stelvio has a rear window wiper to help rear vision. This is particularly helpful in winter where the rear window is quickly covered in water and snow. Usually there are three speed settings for the rear wiper blade: constant on, intermittent on, or off. The Stelvio? It has on or off, there is no in-between. The rear wiper rarely needs to be constantly on, which leads the driver to constantly turning the wiper on and off manually to get one wipe in the Stelvio. The word “annoying” barely covers the situation. The Stelvio's steering is just slightly slower than the Giulia sedan’s with a still absurdly quick 12.0:1 steering ratio, which in day-to-day driving is fine. When the roads become snow-covered, the crossover SUV feels twitchy in a straight line. 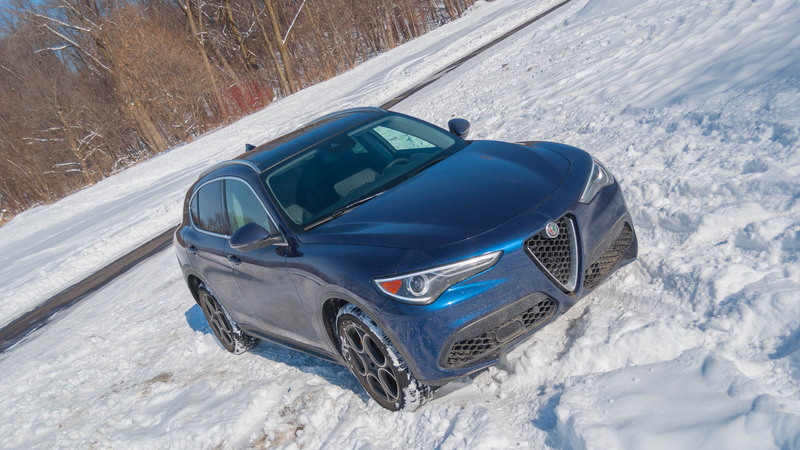 Every little movement makes the Stelvio instantly change course, and anyone that has driven on a highway in a blizzard knows it’s hard to keep the steering wheel still as the tires blast through the snow. Plan on hauling the kids sleds to the hills? Hope those sleds are small as the Stelvio only has 18.5 cubic feet of cargo space behind the second row. That’s smaller than the Audi Q5 (26.8 cubic feet) and BMW X3 (27.6 cubic feet). While the rear cargo area isn’t extraordinarily deep, it’s width that is more concerning. The rear suspension eats into the cargo hold making it narrower. In most cars, the front defroster can be blasted with a simple touch of the defroster button, or split between the lower vents for cold feet and the front windshield defrost vents. The Stelvio skips the latter option. The defrost button puts the system on high heat and cranks the fan speed to the maximum rate to blow as much hot air at the windshield and front side windows as possible, but won’t direct airflow elsewhere, or turn down the temperature while still defrost. This seems like an annoying and silly problem. Having nothing to do with driving in the snow but annoying all the same, all 2018 Stelvios built before March 2018 have comfort seat access (the feature which automatically pushes the driver seat back when the car turns off to ease entry and exit) that cannot be turned off. There may be a fix, an Alfa Romeo spokesman told us—maybe.